I had the misfortune of meeting Dr Green once (he was an expert witness in my divorce case). A less empathic and more unpleasant individual I cannot begin to imagine. The fact that friends who were patients of his seemed genuinely scared of him makes me even more thankful that I was never a patient of his. 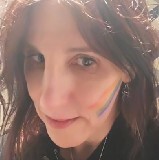 I’ve just turned 52, and I’ve been visible for 16 years now. I’ve lost count of the number of trans people (or parents of trans kids) who have come out to me in places I didn’t expect. Thank you for sharing her story. We can only hope that she is now at peace. Go you! There’s no right or wrong way to be trans. In this case, Anna-Jayne Metcalfe, I think the problem is very sector specific. It’s not an industry I know, which is probably fortunate. Glad to hear New Orleans is LGBTQ+ friendly! Thank you for writing this. It’s given me an insight into a type of nasty discrimination I’ve not experienced myself. Having created the @stoptransviolence Instagram channel your blog post is especially connective. Thanks Jenn. It’s hard to put into words what I feel about all of this, but I’m doing my best to try. I do know it’s horrifying, and exceptionally humbling. The phrase “terrible privilege” keeps rattling around inside my head, and it seems apt. We’ve belonged to Transgender Violence News group for years. Thank you for everything you do too!